Fashion Blogging- Lame or Not?? 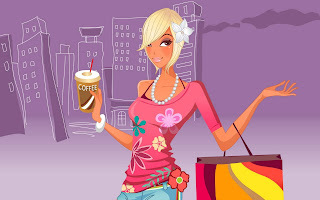 :O | The Shopaholic Diaries - Indian Fashion, Shopping and Lifestyle Blog ! This is gonna be a longgggg posttt and not at all related to my hauls or OOTDs. So please cooperate and I Would love to have your views over this post. Last night I was having a conversation with my friend, who has just started blogging ( not a fashion blogger ) and she keeps reviewing my blog and tells me about what she likes and what not. And last night she wrote in her blog, that she thinks some fashion bloggers are LAME !! and just are mostly into SHOWING OFF- and making young followers drool over their wardrobes and perfect figures. Today we had a long conversation about the same topic. And it made me think, is Fashion Blogging really lame or simply, what exactly is Fashion blogging?? Well 1st of all- I don't call myself a Fashion blogger- coz as such am not posting about any fashion trends / style statements / or giving any advice on how to wear what or whatever !! To be frank I don't even myself know what a FASHION BLOGGER means !! Its too wide a term I think !! Blogs that only occasionally mention fashion are not categorised as fashion blogs, although they may be labeled by the blogger as such." So as such being a Fashion blogger is not only doing the OOTDs or talking about the latest trends, it means to be being wider to d aspects of entire Fashion industry. In my views, I haven't come across many pure Fashion blogs. And the same was the point by my friend- She noticed some blogs filled with just images of the OOTDs and the outfits were not even closer to what a normal girl would wear for a normal day or to even a special occasion for that matter. And I agreed to her point too !! And she says the whole idea of showing off your perfect figures clad in dresses which are impossible to be worn on daily basis ( consider in countries like India ) is lame. And that a fashion blog should focus more upon styling advice or ideas and about outfits that could be worn normally and more often my mix-matching, and ideas about how to multi-use the items in your wardrobe. Is it true that posting OOTDs, hauls etc is making young girls drool and feel bad about their own limited wardrobes or their inability to buy high-end brands?? Hey hun, don't take a blog as "certain" people suggesting everyone about a certaing thing. it's about that person. A "blog" is actually a personal diary where you keep the tab of what you want, like or dislike for that matter... and it's also like sharing your diary with peopel whom you like... the only difference b/w a blog and real life diary is that on internet everyone can read it. HI Nikita, I totally agree with the comment above... everyone is entitled to their opinion, hence they can have their own blog to express it. By the same token, you have the freedom of picking and choosing which blogs to read and follow. What I look for in OOTD's are ideas on how to wear certain pieces, yes some girls have better things than others but to me it's interesting when girls make something inexpensive look expensive with how they style it. I appreciate bloggers who wear eccentric outfits, even outfits that I wouldn't wear in my day to day but that's the thing about fashion, you appreciate the beauty of a piece/outfit. I consider myself falling under the "fashion blogging" category because I do discuss fashion and my outfits a lot but at the same time I don't restrict myself to JUST fashion, I talk about art, my life= topics that I am passionate about. So what I'm trying to say is (sorry about the essay here) is that these blogs are person's individual passions, as I'm sure your friend is blogging about her passion, and "lame" seems like an insensitive word to describe someone's passion. I don't think that fashion blogging is lame but I do agree with your friend that severak outfits are just created for the time of the shooting. What fashion blogging means to me? Independence! I don't have to say that i love this or that just because i am somehow linked to that aprticular brand! I want to highlight what I really like and criticize what I don't like. We should be something different from magazines! Like all other ladies who talked here, i too done think fashion blogging as a lame. I blog because i love it and not to just show off the people. All my posts are driven by my mood or incidents. I agree that there are people who just blog about their OOTs and that a normal girl might not even wear it but it totally in which society or culture you live Like i cannot just follow some LA girls outfit in hyderabad but fr them that might be just a daily outfit. So readers has to use their mind before following something. Same thing applies to hauls and shopping posts. I even find these posts very helpful where you can get a basic idea of deals or new shopping places that you might not find in general. But before spending money like others you have to think yourself how much you earn and what all can you spend. Well i shop from high streets barnds as well as indian and thrift-ed shops not coz i can't effort but coz i love it. And yes you can look gorgeous in non high street brands too. If the girl just read blogs fr hopping thats not god, thy can even learn how to remix their limited wardrobe and create new outfits. Well all i'll say- Its all depend from person to person what they learn from a particular thing and the same happens to blogging. This is a great post because most fashion blogs are only concerned about showing skinny people wearing very expensive clothing. Regular people wearing regular clothes is barley seen or the blogs are just not popular. Thanks for your lovel comments everyone !! The entire point of making a blog is to share your ideas.It can be anything,starting from "outfit pictures" to "what you purchased recently".Different people have different opinions and it's important to respect it,but you shouldn't let it affect you.If you like posting pictures of your outfits or if you love sharing pictures of what you bought,just do it!It's not called "bragging" at all.I understand when a few bloggers post outfit pictures in 6 inch heels ,which isn't practical at all.But we do love looking at those pictures right? Thanks for your comment hun.. and I loved it when you said "your blog is the best thing that happened to you". In my opinion fashion posts should have such outfits which are of the latest fashion & are wearable too. So that it makes a link between the blogger & the readers. Nice blog Nitika...would love to see more posts! Fashion world has a number of options for women, but nowadays men are also not behind.Men's Fashion in Dubai is offering great trends with the intention of converting the fashion industry in Dubai. Inside Dubai, men discover trendiest men’s clothing range.Just visit the Dubai shopping centers and get your best fit .